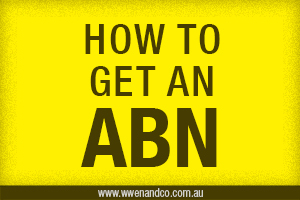 Although it isn’t mandatory to have an ABN, there are a few good reasons why you should. The first is that without ABN, your business will sound and look cheap. Other businesses that deal with you are legally bound to withhold tax. If they make any payments to you and your business does not quote an ABN on invoices, then they must withhold tax at the highest marginal rate. Having an ABN also gives your business the ability to claim back goods and services tax (GST) credits, claim fuel tax credits you qualify for, register to use the pay-as-you-go withholding system, be able to offer fringe benefits to employees, and just generally make dealing with other businesses much smoother. How do I register for an ABN? You can apply for an ABN online for free at the Australian Business Register. Every business that applies only needs one ABN (whether sole trader, partnership, company or trust) and can then run as many enterprises as they like from that single ABN as long as these operations are conducted under the same entity structure – one business can operate for example a furniture shop, a separate curtain outlet and an online fabric supply outlet. But if any of these operations is run by a different business entity, a separate ABN will be needed for that business. You will also need an ABN to register a website domain name with an extension that ends in “.au”, if your business intends to have an online presence. If you choose a company structure for your business, you need an Australian Company Number (ACN) when registering for an ABN (and the ABN will actually be the business’s ACN plus two digits at the beginning). You don’t need to show both numbers on invoices or stationery, just your ABN.